Who Gets To Call Themselves A 'Vermonter'? A "Welcome to Vermont" sign greets newcomers and visitors, but Vermont Edition wants to know: who can call themselves a "Vermonter"? Who gets to call themselves "Vermonters"? We're having a conversation about newcomers, old-timers, and those who have been in Vermont for generations. In the first of our series of Vermont Edition conversations guided by you — our audience — we explore a submission from Neal McIntyre of Londonderry, Vermont. If you've lived in Vermont you whole life, how do you talk with new arrivals? Do you have thoughts on what makes someone a "true Vermonter"? 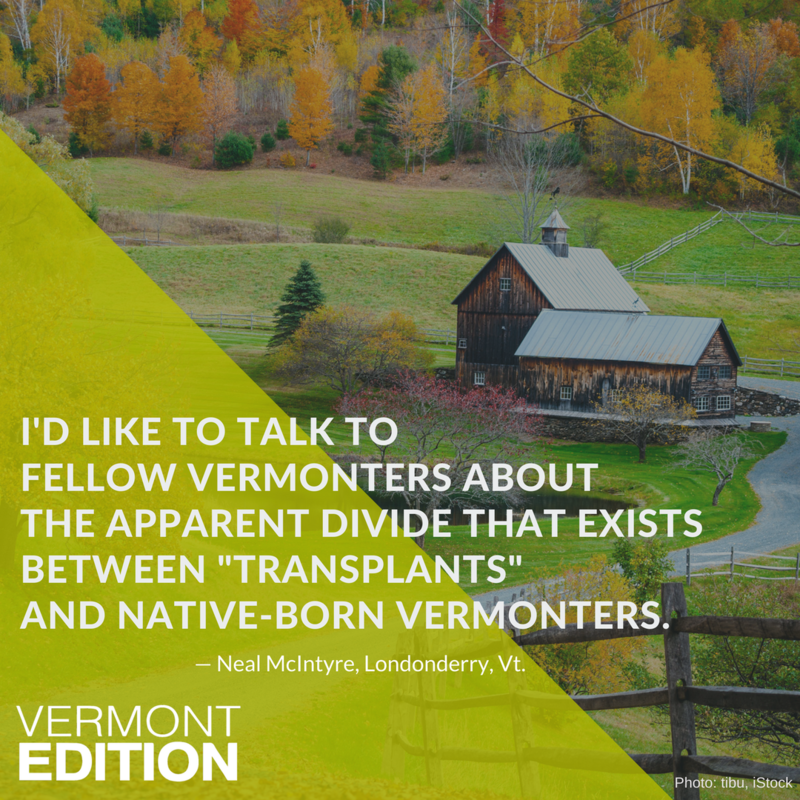 If you're new to Vermont, have you experienced a divide between transplants and native-born Vermonters? What an interesting question! Personally I’m a transplant and will never consider myself a Vermonter as it’s a designation I dont really want to pick up. Personally I think he divide that exists, and it does, stems from “being a Vermonter” being the last thing a lot of people have to cling on to. Days of the week end in "D" not day? You say "so I says?" You know how to pronounce Charlotte? What the hell is soft-serve? You can weigh in as well on reddit, Facebook, Twitter or Instagram. Plus, we'll be joined by Stephen Perkins, the executive director of the Vermont Historical Society, and rural geographer and University of Vermont professor Cheryl Morse, one of the researchers behind the Vermont Roots Migration Project, for a conversation about "flatlanders," "woodchucks," Vermont identity and the relationships between people and place. You can join the conservation by posting below or emailing VermontEdition@vpr.net. Broadcast Tuesday, Nov. 28 at noon; rebroadcast at 7 p.m.
Is there a local issue you want to talk through with your fellow Vermonters? Something you'd love to discuss with someone from a different background or with a different point of view? Use the module below to submit your idea — or ideas! — with your name, zip code and email (so we can get back in touch with you). For decades, Vermont Life magazine has projected a bucolic image of the Green Mountain State. But it has struggled to hold on to subscribers in recent years and racked up over $3 million in debt. Now nine bidders are in the running to take over the state's signature promotional magazine. Winter Reading Show: What Are Good Books To Curl Up With This Season? One of life's joys is losing yourself in the pages of a good read. As it gets colder outside, we're talking about books to cozy up with — and we want to hear what titles you suggest your fellow listeners check out.